Amrut Rye Single Malt (46.0%): Now this is a label which would make SWA go nuts if it was bottled in Scotland... But at the end the whisky is distilled from 100% malted rye, so technically it is a single malt. 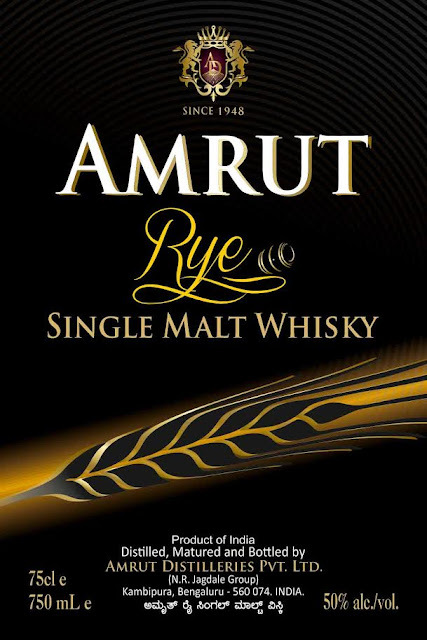 Amrut distilled this whisky from 100% malted European rye grain and then aged it exclusively in new American oak barrels. Since I heard about this whisky last September from Raj Sabharwal of PVI Global fame I was waiting for this day to come... Now the sample is on my desk and cannot wait for another second more to pour it in my glass. Color: Dark amber, chestnut honey. Nose: Rye it is... But definitely a less spicy more fruity nose compared to its cousins from New World. Stewed prunes, ripe mangos and baked pineapple chunks. Fruit cake right after you take it out of the oven, raisin-rye muffins and dense German rye bread. A couple of water drops open it for cumin, cinnamon and cloves. Black currant jam and fig paste... I have to move on but cannot stop nosing. Like walking around in an exotic food market somewhere far away... You simply don't want to leave. Finish: Medium long... And tart... First time I remember experiencing tartness so pronounced on the finish of a whisky. Freshly squeezed lemon juice, quince paste and pomegranate molasses. Overall: If this was a blind tasting I would put all my money on this being a rye whisky right after I start nosing but then probably would have second thoughts in seconds: Can it be a very old Irish blend? But after taking a sip I would change my mind completely again and bet on it being an old sherry cask matured Scotch grain whisky... Impossible to categorize... It is so different than anything else I tasted before from nose to finish and this is the pure beauty of it. Amrut is not only releasing a new expression here but creating a brand new category for my two cents... It is an amazingly well balanced, layered and damn tasty but completely different at the same time. Inspirational and innovational work... It might be my favorite expression from the distillery since Amrut 100. They should be very proud of themselves. 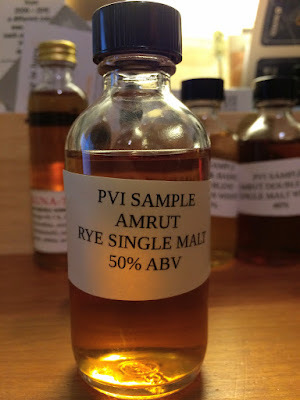 I hope Amrut will continue to play with rye and maybe with some other grains as well in the future. They apparently know something we don't know there and they better use this knowledge for creating more whiskies like this. Kudos to Amrut and thanks to Raj Sabharwal for the sample. Next review will be Amrut Double Cask.